Helping Pockets are something new that I’ve made, and BOY HOWDY are they helpful! To explain how these work, I need to tell you a little story…another jewel from my brilliant friend Heather, who should really have a blog. It is a story about a monkey, a mango and a skateboard. The topic at hand was parenting: how to help your kids DO the stuff that you have to keep REMINDING them to do. She referenced a story about how monkey trainers teach the monkey to ride a skateboard. First, the trianer puts the skateboard in the cage, and the monkey gets a chunk of mango if they don’t freak out. Next, the monkey gets a chunk of mango for touching the skateboard. Next, for sitting on it, and…you get the idea. They don’t punish them, or yell at them, or cajole them. They celebrate *each* step in the right direction. I was inspired! 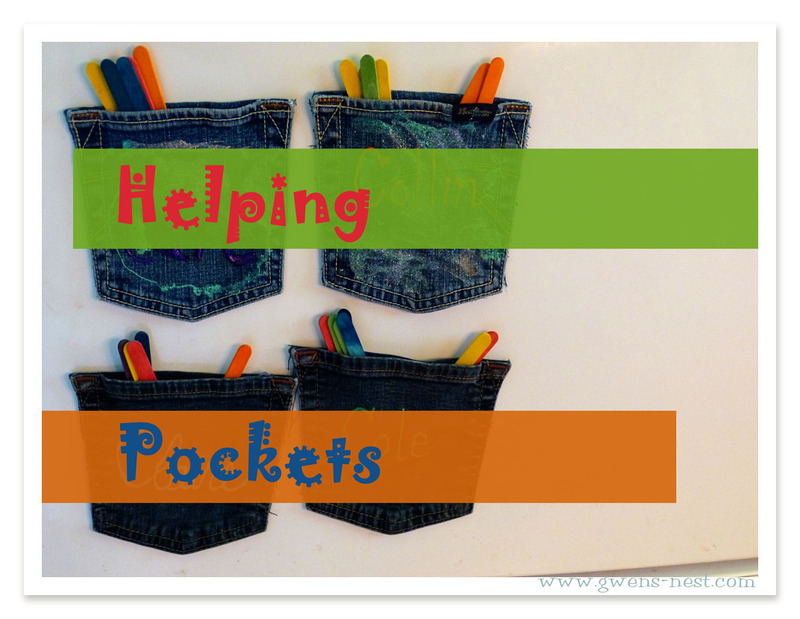 My helping pockets are based on an idea that my Mom was already implementing. 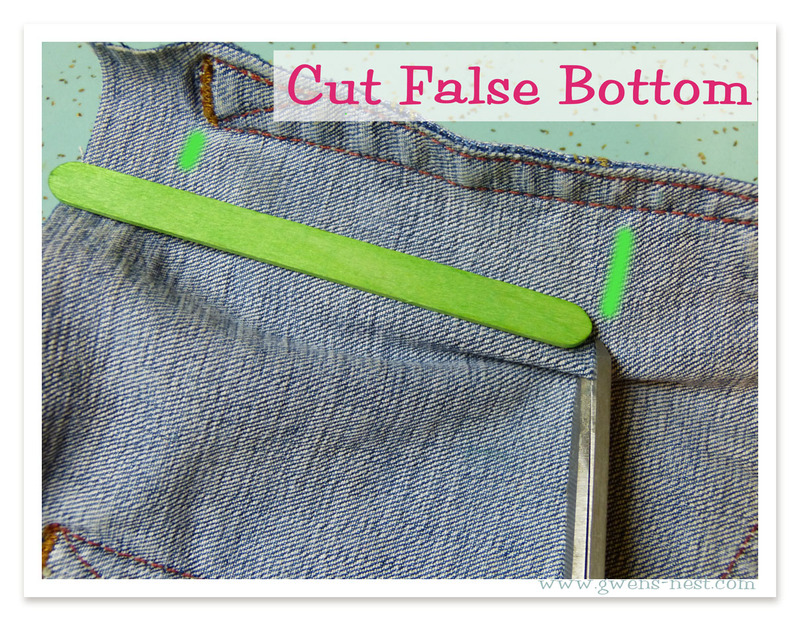 She had designed little felt pockets that magneted onto her fridge, and she rewarded the kids with a colored popsicle stick when she ‘caught’ them doing good: obeying the first time, picking up toys without being asked, or clearing their places at the table. When you get 3 helping sticks in your pocket, you get to pick a piece of candy from her jar. BRILLIANT. The glitter glue and colored popsicle sticks came from the Dollar Tree. 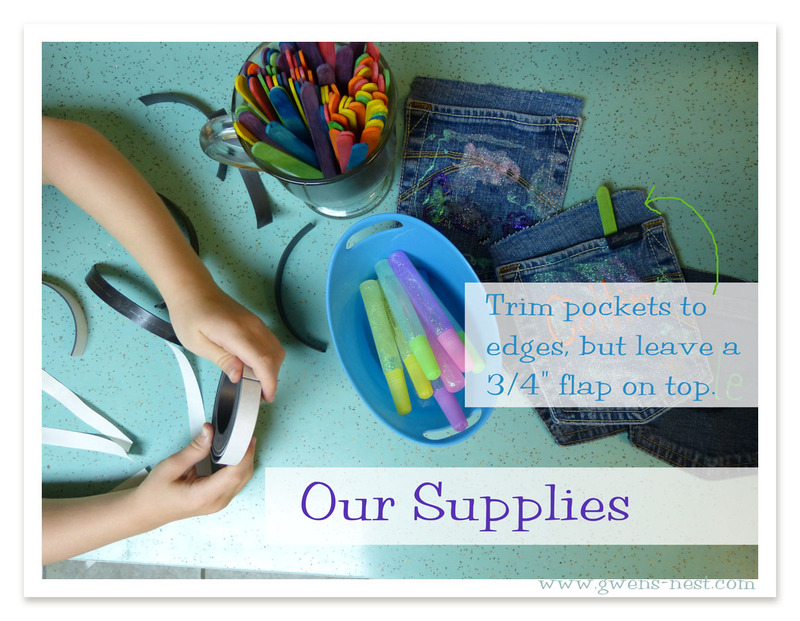 Please don’t spend the money at a craft store…highway robbery, I tell you. 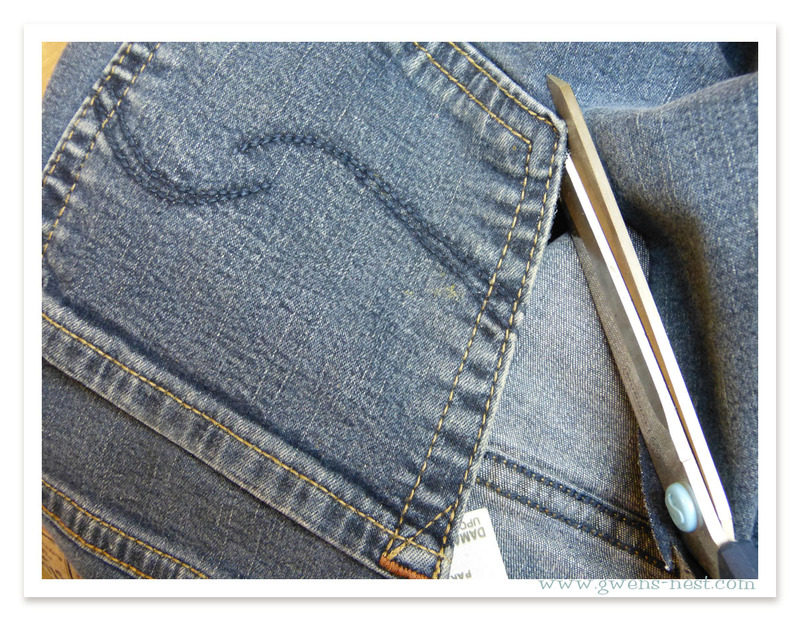 I used 2 pairs of worn out, and outgrown jeans, and cut out the back pockets like so, leaving a 3/4″ flap at the top edge. This will never do. 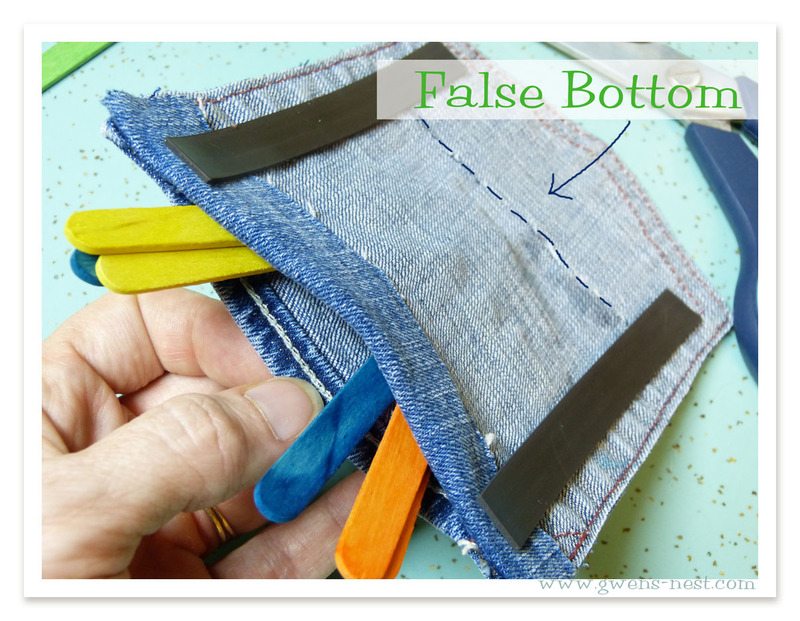 But it’s an easy fix: I measured where I wanted the sticks to stop, and cut a line on the backside of the pocket, and hot-glued a ‘false bottom’ in place. 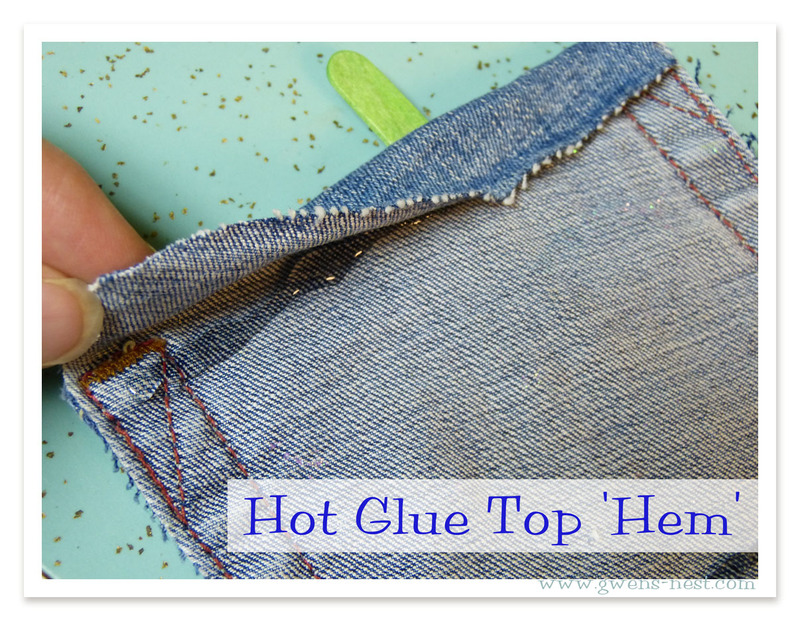 “Hem” the top by folding back the extra flap, and hot gluing it in place. 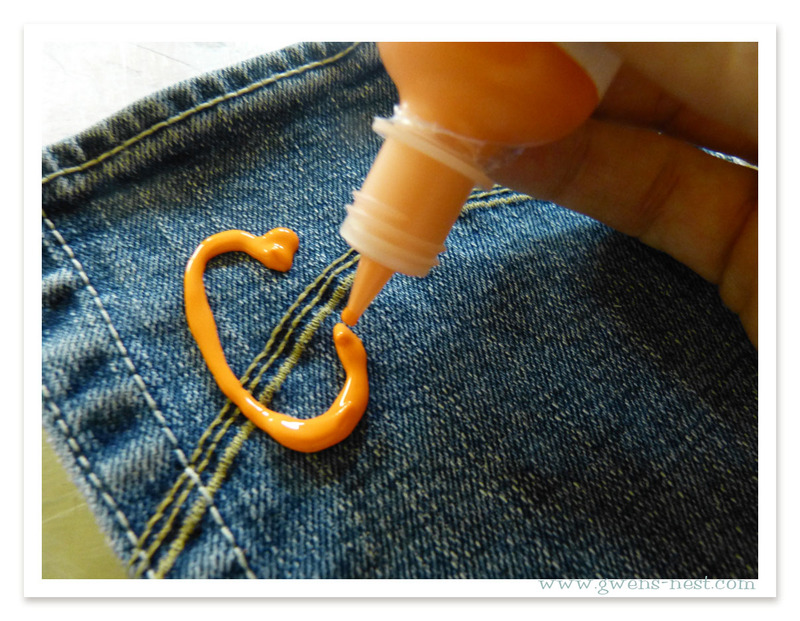 I found it useful to use one of the popsicle sticks to press the fabric onto the glue. Instead of charring my fingers like usual. 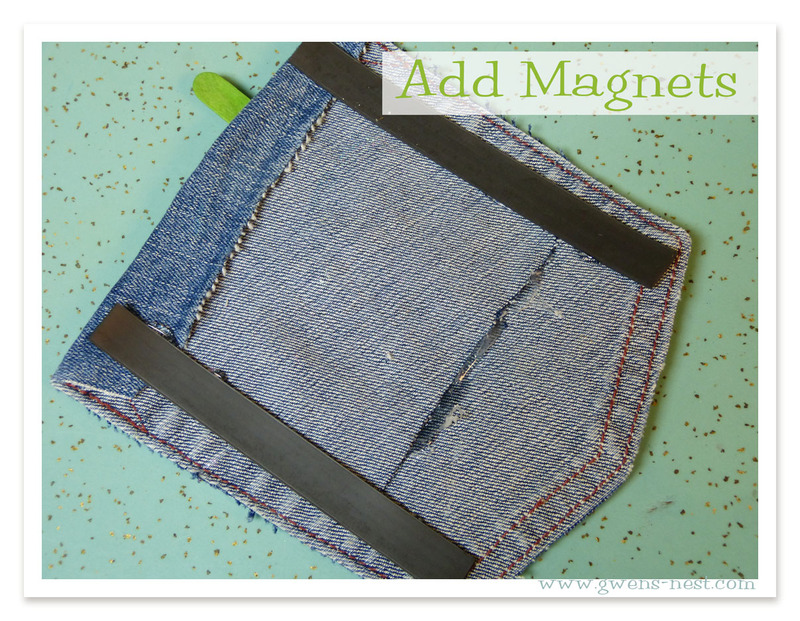 Finally, we added strips of self-stick magnets down the side. I also added some hot glue down those as well for good measure. And there you have it! We’re up and running, with these additions at the top of the fridge. My little monkeys are skateboarding, clearing the table without reminding, and really enjoying the attention and rewards that come with Helping Pockets. 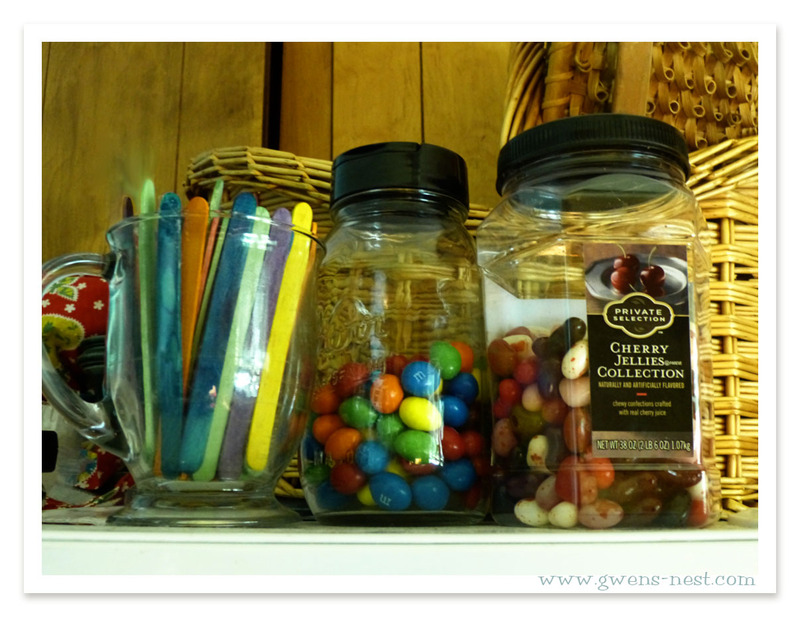 I’m loving that I’m giving away like 1-2 candies a day to encourage LOTS of great habits. Do you have any strategies to encourage kids to remember to do their daily responsibilities? I’m a working mom of 2 boys (5&2) with a magnificent traveling hubby so I’m often parenting “single-mom-style”. Great for bedtime routines, meal planning and out the door in the A.M. Not so much when it comes to discipline, daddy-fun-time cuz I’m home, and everyone listening to “mom” when dad’s in the house. THIS IS BRILLIANT!!!! My boys will do just about ANYTHING for a jellybean. And I’m so tired of being a cranky nagging mom. They will LOVE this idea. Yeah baby. I’m in!!!!!! Many Thx….